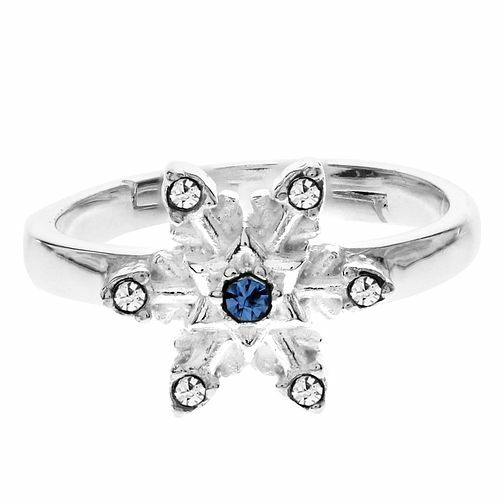 Show your love for the animated Disney film Frozen with this children's snowflake shaped ring. Set with deep blue and clear crystals that glisten like a real snowflake, this ring has been created using rhodium plated silver meaning it is as durable as it is beautiful. So let it go and treat your little ones to a stunning piece of Disney jewellery from H.Samuel. This children's ring comes in a sweet Disney Frozen presentation box, the perfect present for your little ones. Disney Frozen Children's Snowflake Ring is rated 5.0 out of 5 by 1.